School buildings can be seen at Solebury School, a co-educational private boarding and day school, Wednesday, Feb. 1, 2017, in Solebury Township, Pa. The Solebury School is one of several schools that has moved to a later start time. More and more Pennsylvania school districts have been paying attention to the science of the sleep studies. Sara Hoover is a freelance reporter covering education issues for WHYY/Newsworks. Her print and public radio work has featured: gas station sushi, the world's longest serving bat boy, an online cremation urn business, an eco-friendly movie theater popcorn bag, and an entire college football team that joined the Marines at halftime. Sara graduated from Temple University (Go Owls!) with an English degree, earned an MFA in creative writing from the University of Memphis, and studied radio at the Salt Institute for Documentary Studies. Her pieces have been featured on All Things Considered, Marketplace Morning Report, Publishers Weekly, The Metro, among others. Students in a Chester County school district could get more ZZZs beginning next year. The Phoenixville Area School District is the latest in Pennsylvania to vote in favor of later start times. High school and middle school classes in Phoenixville will start 45 minutes later. Elementary schools will open 35 minutes later. Officials took into account concerns about child care, transportation, and after-school activities, said Superintendent Alan Fegley. “I think that’s what we have to show folks: that we can make the move to a more timely start that is more in line with the circadian rhythms of the students and still allow them to be able to complete everything that they want to do,” he said. The change is partly based on recommendations from the American Academy of Pediatrics and the Centers for Disease Control and Prevention that middle and high schools start no earlier than 8:30 a.m. to give students more time to sleep. After seeing a presentation on the topic by the Chester County Intermediate Unit, which provides services such as special education to the county’s school districts, Phoenixville commissioned a team that spent 18 months examining the issue and holding public forums. Fegley says they wanted to reach the 8:30 a.m. start time for secondary schools, but settled for 8:05 instead. The superintendent compares the compromise to a doctor recommending five daily servings of vegetables. “As individuals, we will sit there and say, ‘Wow, I can’t quite do that, but maybe I’ll get three.’ And so that is where we are,” he said. He estimates the shift will cost $300,000 for additional transportation needs, including rescheduling bus routes so private school students can still get to school on time. 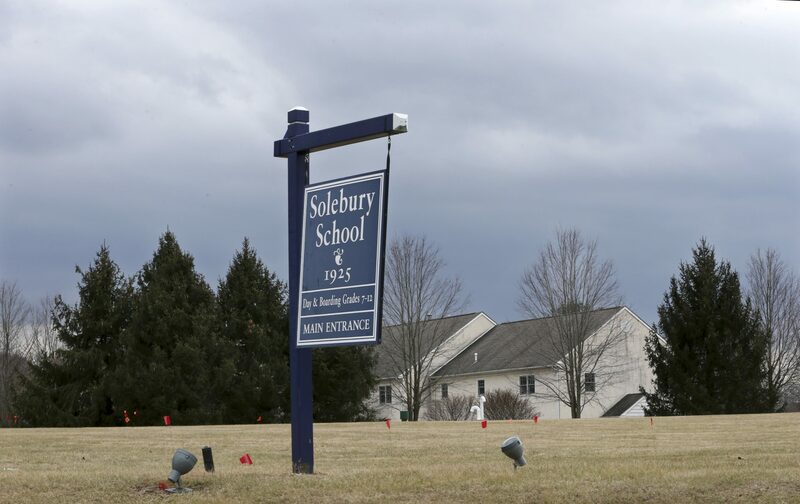 The Solebury School in Bucks County made the move three years ago, pushing its start time ahead 30 minutes to 8:30 a.m.
Scott Eckstein, director of admissions at the private boarding school, says it’s been a success. The school day still ends at the same time of 3:30 p.m., in part because the school shifted its academic schedule to a college model with some classes on certain days of the week, instead of all classes every day. He said more than half of the student population are day students. The morning bus commute is still on the public school system’s earlier schedule, meaning those students who take the bus don’t get to sleep in. The Unionville-Chadds Ford School District is in its second year of giving middle and high schoolers 25 more minutes of shut-eye. Superintendent John Sanville says the switch has exceeded expectations for what he considers a modest change. “It’s made a tremendous difference for kids. Now what we know for a fact is that our kids are sleeping more. They’re more alert,” he said. He says the positive feedback from parents has outpaced the negative by 10 to one. Unionville-Chadds Ford had anticipated the new start times would increase their budget by as much as $40,000 around the transportation costs of nonpublic school students. However, those costs did not increase, Sanville says. He cautions others that implementation is not as easy as it may sound. It all began from a student effort to come up with ideas for improving the high school that turned into a multi-year project and presentation to the school board. Several other districts are considering whether to follow suit, including in Lower Merion and Radnor Township. More than a dozen districts in Central and Western Pennsylvania have already done so, according to the group Start Schools Later, which is part of Regional Adolescent Sleep Needs Coalition. Last fall, the state Senate adopted a resolution to form an advisory committee to study high school start times throughout the Commonwealth. That study is due to the General Assembly this fall. The Joint State Government Commission is conducting the research and will present its research to the advisory committee at its first meeting on Feb. 8.